14.2 Megapixel camera optimized for single particle structural biology, cryo-tomography, plus high-speed dynamic and in-situ electron microscopy. The K2 Summit® electron counting direct detection camera is simply the highest performance detector available for cryo-electron microscopy (cryo-EM). The unmatched frame rate of this direct detector allows electron counting modes to improve both contrast and resolution for large and small molecules alike. Comparison between the resolution and molecule size for published single particle cryo-EM structures. 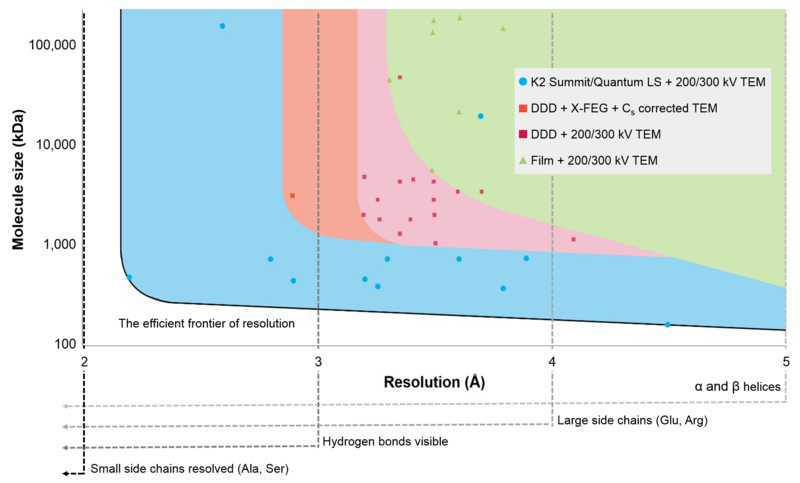 The K2 Summit or Quantum LS have been employed in all the structures which define the high resolution frontier across a range of molecular sizes. All data points listed represent results from www.EMDataBank.org in May of 2015 with a resolution better than 3.8 Å.